L'Étivaz Cheese for sale. Buy online at Zingerman's Mail Order. Gourmet Gifts. Food Gifts. Gruyère, like it was a hundred years ago. L'Etivaz is 19th Century Gruyère, made by a group of 76 devoted Gruyère-loving families who felt that the government regulations were allowing cheesemakers to compromise the qualities that made good Gruyère so special. In the 1930s, they pulled out of the government's Gruyere program and "created" their own cheese - L'Etivaz - named for the village around which they all lived. 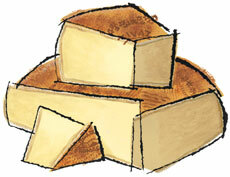 L'Etivaz is made essentially as Gruyère was one hundred years ago. It may be made only when the cows are doing their summer grazing in Alpine pastures in glorious mountain meadows filled with wild flowers and herbs. It must be made in traditional copper cauldrons, and only over old-style, open wood fires. The resulting cheese is superb - a bit creamier, less sharp than the above-mentioned Antique Gruyère, yet exceptionally smooth and flavorful. Aged for over a year, L'Etivaz has a firm texture, a melt-in-your-mouth butteriness, and a lingering lilt of succulent Swiss mountain cream on your tongue. Holy cow! The wheel we just opened is amazing. It has huge flavor wth a big of fruity sweetness that practically reminds me of Fruit Loops above a bit of savory, nutty richness. The flavor builds and lasts for a long time.